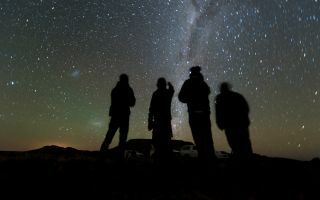 Four members of the New Horizons’ South African observation team scan the sky while waiting for the start of the 2014 MU69 occultation, early on the morning of June 3, 2017. The frigid, faraway body that NASA's New Horizons spacecraft will zoom by 18 months from now may actually be a cluster of small objects, new observations suggest. So New Horizons team members set up shop in various spots along the occultation path and pointed their telescopes skyward. They ended up taking more than 100,000 images of the occulted star, none of which captured 2014 MU69 itself, NASA officials said. "These results are telling us something really interesting," New Horizons principal investigator Alan Stern, of the Southwest Research Institute in Boulder, Colorado, said in a statement. "The fact that we accomplished the occultation observations from every planned observing site but didn’t detect the object itself likely means that either MU69 is highly reflective and smaller than some expected, or it may be a binary or even a swarm of smaller bodies left from the time when the planets in our solar system formed," Stern added. The team may be able to narrow down these possibilities soon. MU69 will make two more stellar occultations this month: one on July 10 and the other on July 17. New Horizons scientists plan to use NASA's Stratospheric Observatory for Infrared Astronomy — a 747 jet equipped with a 100-inch (2.5 m) telescope — to observe the July 10 event. The main goal is to hunt for debris around 2014 MU69 that could pose a danger to New Horizons during the upcoming flyby, agency officials said. New Horizons team members will observe the July 17 occultation from southern Argentina, gathering data that could help nail down 2014 MU69's size. Scientists will also use NASA's Hubble Space Telescope to watch that event, searching for hazardous debris. The $700 million New Horizons mission launched in January 2006. More than nine years later, on July 14, 2015, the probe gave humanity its first up-close looks at Pluto, revealing a startlingly complex and diverse world with vast nitrogen-ice plains and towering mountains of water ice. The upcoming flyby of 2014 MU69 is the centerpiece of New Horizons' extended mission, which NASA officially approved last year.